Cryogenic Breaks is ceramic pipe for pure water. For the brazing of ceramics and metal the metallization is necessary in the pre-process. Our self-developed metallization technology, called "Melting Titanium Metallization Method", is resistant to corrosion and elution in pure water. 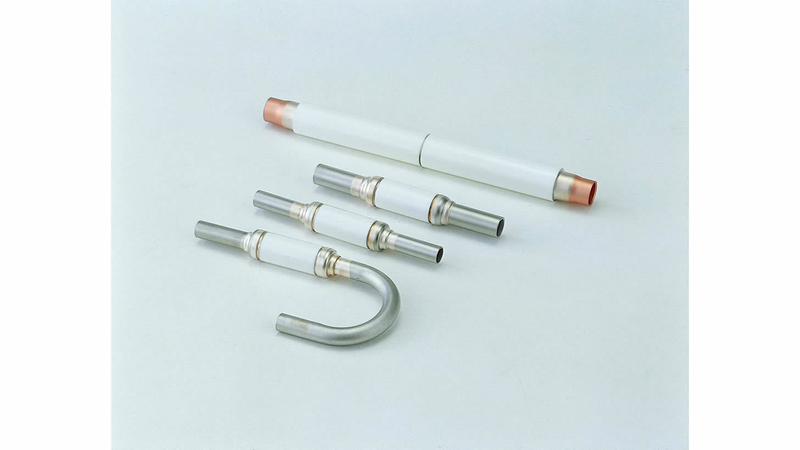 Our Cryogenic Breaks made of ceramics and metal, which are brazed by this metallization technology, have been used successfully in liquid-cooled ceramic tubes and cooling tubes with pure Water as refrigerants for more than 30 years. On the other hand, it was reported on the Mo-Mn metallization that water comes out of brazing parts because molybdenum elutes when it reacts with pure water. Our Cryogenic Breaks are used not only in ceramic water-cooled resistors (pure water cooling, liquid-cooling), but also in HVDC (High Voltage DC Power Transmission) and in SVC (Static VAR compensator) and in water-cooled resistors with large capacity which directly pass pure water into an alumina ceramics tube for cooling. Furthermore, they are also used for the cooling of electromagnets in proton accelerators, because ceramics, an inorganic materiel, can be exposed to high radiation doses.